However, without a doubt the most common question I’ve received over the past two seasons is, “What shoe would you recommend to replace the Pearl Izumi Trail N1/N2?” This now-defunct and beloved trail running shoe series, designed with input from such notable ultra legends as Scott Jaime and Nick Clark, was discontinued in 2015 so that Pearl Izumi could cater to the legions of cyclists and triathletes who spend five to 10 times more on gear per year than the usual, somewhat frugal, trail runner. So, on a regular basis, I’ve recommended such trail mainstays as the Nike Wildhorse, the Hoka Challenger ATR, and the Saucony Peregrine. But, none of these trail shoes have truly embodied the simplicity and smooth ride of the Pearl Izumi Trail N2. However, one shoe is getting pretty close. 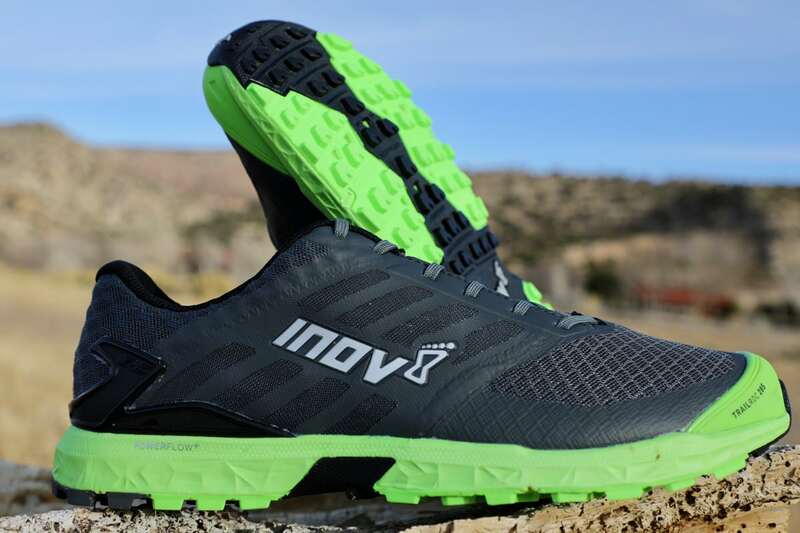 Enter Inov-8’s updated TRAILROC series, specifically the Inov-8 TRAILROC 285 ($150) in this review. In full disclosure, I haven’t enjoyed running in an Inov-8 shoe since the old TRAILROC 245 and 255 from 2012, but this update is an entirely different animal. I also completely understand that the regular terrain I run on (dry and rocky) is not what most of Inov-8’s bog- and fell-worthy line was designed for. 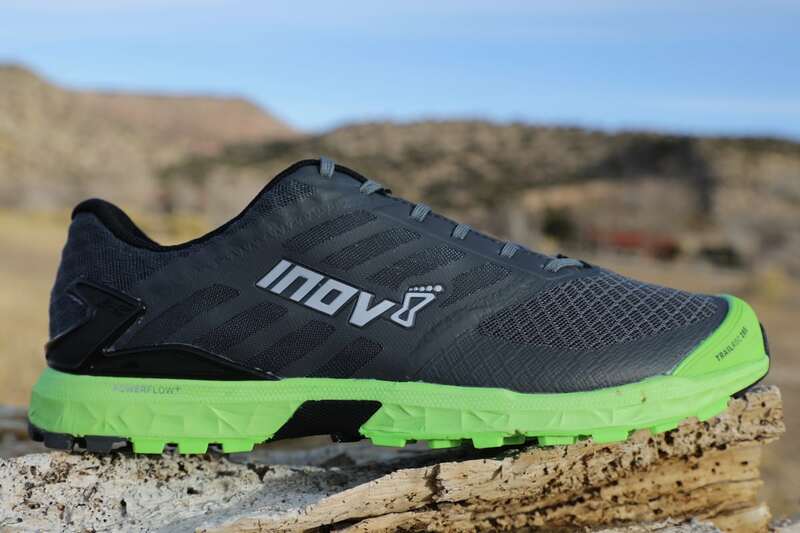 At its core, the Inov-8 TRAILROC 285 is a simple running shoe. Seamless mesh is featured throughout the shoe, and this dual-density mesh can take a beating and then some. The fit is also classic Inov-8 with a low but snug heel collar, which gradually opens up to a wide toebox without ever feeling sloppy. This is one of the few shoes on the market that offers me the kind of toebox space, with ample room for swelling, plus midfoot lock that doesn’t slide around on steep downhills. My first inclination after trying the shoe on was that the toebox might be a bit shallow, but I never experienced an issue during runs and I deliberately wore thin to midweight socks to facilitate having some room around the toes. Sizing can be tricky in this shoe, and I would recommend sizing up a half size unless you like a snug fit. While my U.S. size 10s feel great on a casual trail run, I know that I’ll need a bit more space up front to accommodate swelling during an ultra. Part of the space/sizing issues could be partly blamed on a very durable rubberized toe cap. I’ve caught a toe a number of times in this shoe and I’m always surprised that my toes don’t absorb any of the impact. Inov-8 uses their Met-Cradle+ synthetic overlays at the midfoot, which supply a great deal of midfoot lock down without any added weight. Welded overlays also grace the rand of the shoe to provide some puncture resistance, and rubberized heel-cup supports provide some structure to an otherwise very flexible heel fit. Again, just a fantastic-feeling shoe that you lace up and completely forget about during the run. The Inov-8 TRAILROC 285 lateral upper. The midsole of this shoe is what really surprised me as I was expecting a very firm feel with little energy return. In fact, my first impression of the shoe while trying it on was exactly that, but after several shorter runs in the TRAILROC 285, I found my feet to be liking them more and more. While the feel underfoot is responsive (firm) and protective (rock plate), it never feels heavy or cumbersome and the midsole is flexible enough to easily adapt to changing terrain. 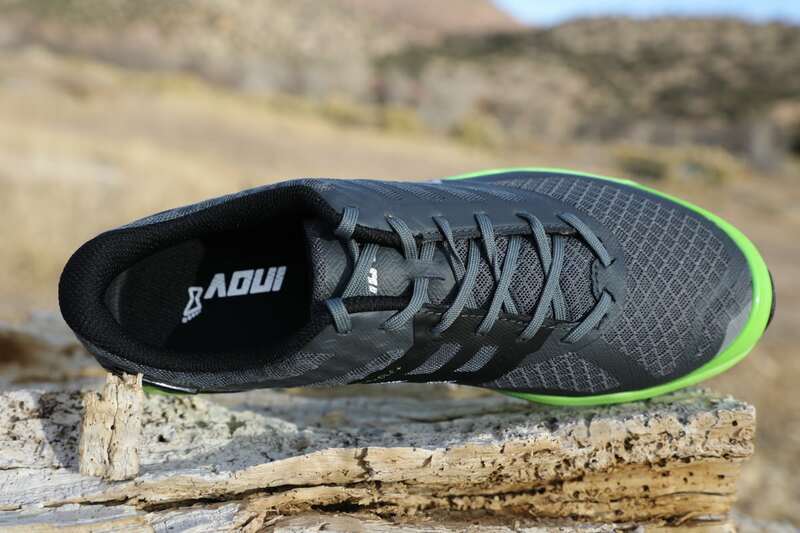 Inov-8’s Powerflow+ EVA foam is much better than anything they’ve ever produced, and I’m not feeling the resiliency of the foam die out in any way. Additionally, the Dynamic FasciaBand provides some propulsionary support and the Meta-Shank insert is a lightweight rock plate from the midfoot forward to just behind the metatarsals. I have been very impressed with how protective this shoe is despite having a relatively low stack height of 23mm in the heel. The TRAILROC 285 really does allow one to bomb down technical terrain without fear of a stone bruise or rolling an ankle to its low and agile ground feel. The Inov-8 TRAILROC 285 medial upper. This is always an area where I expect Inov-8 to shine, and the TRAILROC 285 grips every surface very well. Inov-8s Tri-C Sticky compound wears very slowly and features different-durometer rubbers in different areas of the outsole to take on various conditions. Particularly, the softer rubber in the middle lugs works great on wet surfaces while the harder, outside rubber really grabs loose surfaces on uphills and downhills. I haven’t ever felt this confident in a shoe on downhills due to the combination of just enough cushioning with great traction. In my opinion, which I recognize is entirely subjective, this is one of the best trail shoes to come out in the last three years. It is understated, absolutely functional, and disappears on my foot during longer runs. While I’ve yet to understand why Inov-8 charges $150 for this shoe, I do feel that its worth it due to the durability and versatility. 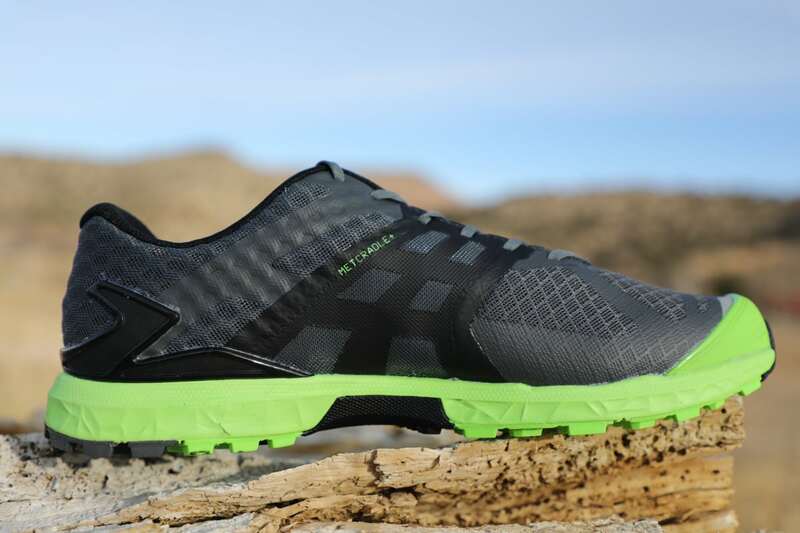 This is also one of those trail shoes that fits into that Goldilocks area of being relatively lightweight (9.9 ounces for a men’s U.S. size 9) and featuring an endurance-friendly heel drop of 8mm. What the Inov-8 TRAILROC 285 is lacking is an overbuilt outsole, a midsole height over 30mm, and far too many overlays. Whether or not you’re looking for a replacement for your beloved Pearl Izumi Trail N1/N2 or if you’re in the market for a jack-of-all-trades simple trail shoe, I highly recommend the TRAILROC 285 to take on any surface and distance in the upcoming year. I have enjoyed this shoe more than anything I’ve worn in recent memory, and the combination of a great fit (forefoot width) along with a sticky and responsive ride made this the shoe I reached for every morning this past fall, regardless of the conditions. Consider sizing a half size up if you’re looking at taking this shoe toward the ultra distances. Otherwise, strap it on and shred. Have you run in the Inov-8 TRAILROC 285? What are your overall thoughts on the shoe? What do you think of the fit of the shoe? Would you size up a half size like Tom recommends for longer distances? Inov-8 outsole talk, have you run in the Tri-C Sticky outsole compound that’s on this and some other Inov-8 models? What is your home terrain and how does the compound perform on it? Great review, Tom. I am down to my last 2 pairs of beloved (dare I say “perfect”?) PI Trail N2s and have been searching desperately for a replacement. Ironically, I’ve now got about 20 miles on a pair of Inov-8 Traitalon 275s. Not sure the exact difference between those and the Trailrocs — except for 10 grams — but they sound very similar and look identical (same color scheme). I’m up a half-size over the N2s. The Trailtalons are *not* the N2s — nothing ever will be :( — but so far thy do see like a possible long-run replacement. Won’t know til I get them out for a seriously long run. Do you what the actual differences are between the Trailroc and Trailtalon? I feel like I need my own tutorial sometimes! While I haven’t run in the TrailTalons, I’ve had them in my hand and they’re a 4mm drop and a lower stack height of 17.5/13.5. So, the Trailroc 285 would feel a bit beefier and less minimal, but I think there is adequate ground feel with the 285s. Despite what photos look like its not a bulky shoe at all. Hmm, the stats I’ve seen put the Trailtalon 275 at an 8 mm drop with 25.5 and 17.5 stack. And I would say that is how they feel. Though, in a strange twist, when I go now to the Inov-8 website it doesn’t even show the shoe!! This has happened to me often at their site. In any event, it does beg the question as to what the actual differences are in construction between the Trailtalon and the Trailroc. Hi, Andy. Have you tried the Nike Wildhorse 3/4? In several reviews of the Wildhorse, people most often liken it to the N2. Another trail shoe I’m also enjoying is the Saucony Xodus ISO 2. 4mm drop (my first, but no issues, on the contrary, it’s really nice), good traction (better than the Pearl Izumi), rugged upper that can take all the abuse in the world. The shoe is firm and stiff until it breaks in, but afterwards it rides really well, pretty agile over technical terrain, eficient over smooth terrain, handles road sections like a champ. Durability seems second to none in this second version. I ran most of my miles last year in TrailTalon 275s. By comparison the TrailRoc has more smaller studs I believe optimised for rocky trails. Also a rock plate and beefier toe bumper, but the new model TrailTalon moves in that direction. I’d guess the smaller studs on TrailRoc won’t shed mud as easily? Don’t think the TrailRoc (or the ParkClaw… no toe bumper) make sense for mixed road/rocky trail/mud/fell in dry weather. Nice review, definitely has me thinking. I’m just breaking in my Roclite 290’s. For the most part I like them (290s), however, and maybe I didn’t size up enough, but they feel very tight in the toebox compared to when I tried the trail talon’s 250s. Unfortunately In Spain Inov8 are hard to come by so I couldn’t try the 290s prior. It sounds like the new TrailRoc 285s have very similar characteristics but with a more generous toebox? I can’t figure Inov8 out. I know they have precision fit for some models (x-talon) but I would expect them to have a similar fit philosophy unless otherwise specified… In short, i want the all-round performance my 290s give me, with great balance of cushioning/feel and grip for almost any surface, but without it costing me my a toe nail (damn you greek foot)! In the past they had Standard and Precision fits. Now they describe with based on number scale 1-5 (fit scale). Roclites are 3, Trailrocs are 4 which means that they are a bit wider. Check Inov-8 website for more info. I would add that Trailtalon and Terraclaws are also rated as both 4s. However, the fit is quite different, with the Terraclaw being considerably roomier in the toebox (taller if not also a tad wider) such that an 11 is perfect, whereas in other models, including the Trailtalon and even the Parkclaw (which is rated at a 5), I have to go up a half size. The panoply of shoes from Inov-8 is great but it can be really hard to decipher which, if any, will work for your feet. Sometimes there can be too much of a good thing!! Agreed. The Terraclaws had much more room in the forefoot and space between my big toe and the front of the shoe in the same size 10 as the Trailroc 285. Inov-8 has certainly improved immensely in material durability. Where as in classic models back when Inov-8 was true to its fell running roots I’d destroy a pair in 50-100 miles, now I can get that many miles without holes in the upper and an outsole still made of rubber. Overlays placed in a way that the upper does not instantly fail at the seams, rubber compounds that last longer than minutes while providing impressive grip in soggy terrain, and a heel collar that is both secure and does not rip the skin off my Achilles. Only why must the lasts be changed so often? Now the precision last is painfully skinny and the standard last is uselessly curved. Some of us do want to feel every pebble under our feet, and consider it normal to destroy a pair of shoes in 50 miles. And last I checked my feet haven’t changed in the last decade. I’m grateful that you’re in the beat finding PI replacements. 9.9 oz still seems like it’s heavier than a good shoe needs to be, but it’s within range, and you’re right that a lot of shoes far exceed that weight, without enough benefits for me to consider them. As soon as I read the review, I googled the weight of my preferred shoe- the Salomon sense pro. And so I ended up reading your review of that shoe, which is about 1/2 oz lighter, fits my foot great, and lasts a long time. I agree, it could be a hair softer and have slightly bigger lugs. . . Not sure if I should try this innov-8 or the sense ultra next. That said, my feet felt fine after 100k of Sierra granite wearing the sense pro. I love the Sense Ultras, and I’ve worn them a great deal over the last four years. They have incredible durability and a great feel on my foot, but they are just a touch too narrow and firm for me. I’m envious of runners like you who can wear them over 100k. I’m currently testing the Salomon Ride, and it solves the cushioning issue for me, but sadly, not the forefoot width.I think if the uppers were a bit more flexible around the toebox I’d be fine, but that would sacrifice durability. How do these compare to the Salomon Sense Ultras? The measurements seem very similar. See my comment above on the Sense Pro! I have not worn the Sense Ultra other than trying it on at a local store. Can anyone else speak to this? $150 shame they still use those horrible laces ! I found these laces to be an afterthought. No issues and they stayed tied. What don’t you like about them? As an Inov-8 team member, it’s heartening to see such a positive review. In my opinion, the TrailRoc, both 270 and 285, is hands down the best shoe to date from Inov-8 and the first to do a good job at all of my desired qualities in a trail shoe – nimble, light, protective, holds foot well, and durable. To address some other commenters here, the TrailRoc has a full-length rock plate. The TrailTalon, TerraClaw, and RocLite do not. In fact, I think it is their only model with this particular mid-sole design. I had recently with any other model of shoe used an accessory stone guard – not ideal, but rebruising heels and metatarsals is a no-no in my book. The weight is less than advertised for the 270 and 285 – more so than the multitude of other Inov-8 shoes I’ve worn. My 285 in M-8.5 came in at 265g and the 270 came in at 255g. Gary and I (also a Team inov-8 member) have both enjoyed this shoe tremendously. One thing I should mention is that my TrailRoc 285’s take a lot of miles before needing replacing. I’m generally getting 450-500 miles per pair, even on rough terrain. I’m used to a 4mm drop but was suggested to give the 285 a go as it might feel as less than 8. And indeed it felt fine, would have guessed it to be more in the 4mm than the 8mm area. (This contrary to for example to Roclite 305). So if you’re a 4mm type, you may still want to give these a look. I just got the wildhorse for my n2 replacement and I completely disagree that they are anything like them. They are not terrible but a lot like Peregrines. They are much softer, tighter across front and nothing like N2’s transition. Hope I can save someone else the return shipping. I hike 12-20 miles and just would like my little toe to not go numb after mile 11. I don’t like Altras so I guess I’ll try these next. It appears the Terraclaws are the widest from the comments. Thanks for help. Not sure if anyone mentioned it above, but also hopeful about the new La Sportiva Lycan based on what I’ve heard and read, just out and available at the LS website and coming to other retailers soon. Similar stats to N2s, wide-ish toebox. Though if my old Helios are any indication you’ll have to go up at least a half if not full size. Much to like about the 285: Protection-wise, it’s bulletproof, with full-length rockplate, and I sense nary a hint of hotspots in the upper; low-height toebox, but adequate width across the metatarsals, and the foot is held down well with only slight lacing adjustments. 12oz in US13M is reasonable. However, I feel the balance between stiffness/protection and shock absorption/comfort is not ideal for me, and in particular heel landings approach what I would call ‘harsh’: The heel is very stiff, with little shock & vibration dampening on impact. I expect, and indeed appreciate a somewhat stiffer forefoot to prevent foot pummeling from rocks, but feel the 285 would benefit from shifting this balance more to shock absorption, which would also help the outsole wrap around rocks for better grip, instead of sliding over them, as is the sensation now. The rockplate extending to the heel is the most glaring issue for me. It makes heel landings hard and unpleasant, and becomes mentally tiring much earlier than should occur. I much prefer a softer heel as in the Wildhorse (the two shoes are similar otherwise), and have to give the nod to the latter for now. The 285 is a solid shoe as is, but some midsole changes could make it great. Make it so, Inov-8! I am thinking about these Inov’s 285 vs Salomon Sense ultra. Could You compare them with the intention of using in upcoming races on hard, rocky terrain (40-60km). In general salomon shoes fit better for me and i love the quicklace, but I send back to the complaint my trailtalons 285 (which is too wide for me actually) and I;m thinking about that new inov’8s model. I’ll be thankful for any advice. Have you run in the Inov-8 TRAILROC 285? What are your overall thoughts on the shoe? -Awesome considering they survived 5 weeks of running and hiking in the Pyrenees; specifically, in the country of Andorra. They (the shoes, me too) got thrashed through late melting snow and razor sharp rocks. They got tore up a bit but still wearable and the lugs have some life still. I only used them for half my race (Euforia, took 89 hours to finish), I switched to my Speedcross 4. I was getting too tired and had more confidence in SC4 on the downhills and the snow. I will be taking my beat up 270s to Leadville this month. It will there last hoorraahhh for them. What do you think of the fit of the shoe? – considering my feet don’t suffer, I would say they fit fine. I have never found the need to upsize shoes. I wear 11 buy 11. Would you size up a half size like Tom recommends for longer distances? 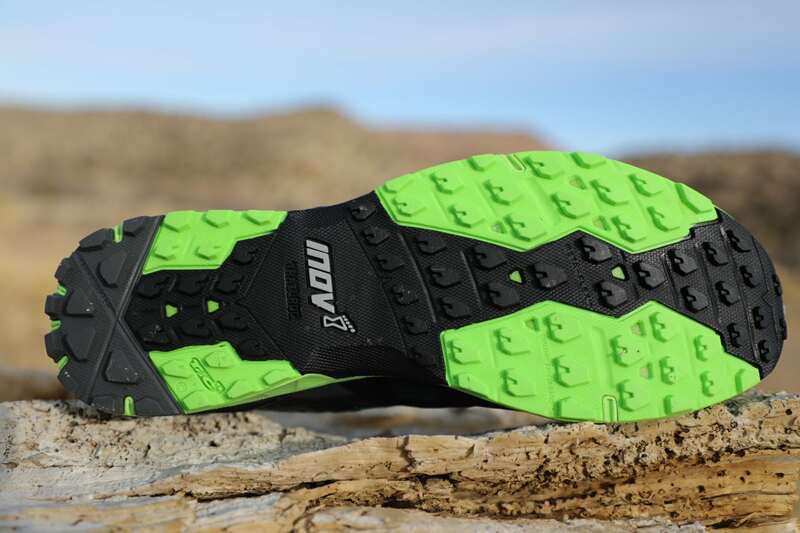 Inov-8 outsole talk, have you run in the Tri-C Sticky outsole compound that’s on this and some other Inov-8 models? -no idea what you are taking about :-), I am just a Florida redneck who likes to run mountains. What is your home terrain and how does the compound perform on it? -don’t wear them here. Live in South Florida, train on the road but race on trails. Trails here don’t require anything special. I only purchase specific trail shoes if the terrain requires it. Sorry, I don’t know know all shoe jargon. Aint my thing. Peace. Thanks for the great review. I’m in search of a new shoe after Salomon ruined the S/Lab Sense with version 7. Ironically I went to the S/Lab Sense 4 after the old TrailRoc was discontinued. It might be time to try these again. The new Salomon Sense Pro 3 is great in the mountains, but not as good for everyday runs. How do these compare fit wise to the original TrailRoc? The S/Lab Sense 6 fit my low volume foot perfectly. IMHO the 285 with its hard stiff stack and narrow platform is tippy and uncomfortable on rocky terrain, similar in complaints from me as with the Sense Pro 2. I suspect I’d be much happier with the Trailroc 270, apparently the same platform but without the extra stack carelessly slapped on. I also love basically everything about the Sense 6 (yes i’d like just a small amount of extra stack for long efforts), and also feel the Sense 7 went way overboard towards lightweight forefoot runners, and rejected 180lb people like me who need some heel flare for a little stability. Anyway, I’d suggest you look at the Trailroc 270 before the 285. I train and race in both 270 and 285 and like both. Those are my go-to in the Inov-8 line now. I like a low and good handling shoe and the 285 is almost as good as the 270 in that department. The retired TrailRoc 245 fits me like a glove and the newer TrailRocs are a fairly similar fit. Try them out – if not at your local shop then there is at least one online retailer who can give you a money back guarantee if you don’t like them. Late comment sorry, but I just ran in the Innov8 285’s today and I really liked them. I do feel the toe box seemed a tad tight/narrow but I wonder if that will loosen with time and use? I wear Injinji socks now (new to me) and when I do, my toe boxes shrink. :-) Despite enjoying my run in them today, I’ve been eyeing the new Salomon Ultra Pro too. Has anyone tried that shoe? The reviews I have read said that the tongue is thin causing some discomfort. I just wonder if the toe box is wider on the Salomon Ultra Pro compared to the Innov8 285 and how the two compare overall? Sometimes I guess the only way to know is to get both and try them out but …. ouch $$$$.